I originally made this a post, but I think it’s an important enough topic to have it’s own page as well. Is elderberry toxic to chickens? Caution – Potential Toxicity: Elderberry leaves, stems, roots and immature fruit are capable of producing large amounts of cyanide (a deadly toxin). Also, chickens should not be given large quantities of the berries to snack on either—as even when mature, S. nigra contains an assortment of active ingredients, which if ingested in large quantities, can be toxic to poultry. A common misperception is that the European Elder is the edible variety of Black Elderberry and that the American Elder is not edible, or does not contain the same constituents for which the European Black Elderberry is known. In fact, they are now considered to be different varieties of the same genus-species, and current research on the American Black Elderberry indicates that it may actually contain more of the anthocyanin’s and polyphenols thought to give elderberry its health benefits. The seeds, stems, leaves and roots of the Black Elder are all poisonous to humans. They contain a cyanide-inducing glycoside. Eating a sufficient quantity of these cyanide-inducing glycosides can cause a toxic buildup of cyanide in the body and make you quite ill. Symptoms include nausea, vomiting, diarrhea, and even coma. Most people recover quickly, although hospitalization may be required. The fruit of the elderberry is a tiny berry, about 1/8 to ¼ inch in diameter, and about 50% of the berry is seed. Cooking the berries destroys the glycosides present in the seeds, making the berries with their seeds safe to eat. As such, the fruit of the Black Elderberry should always be cooked before consumption. Interestingly, research indicates that exposing elderberry to heat actually concentrates the polyphenols and anthocyanin’s. Verdict: Proceed with caution. 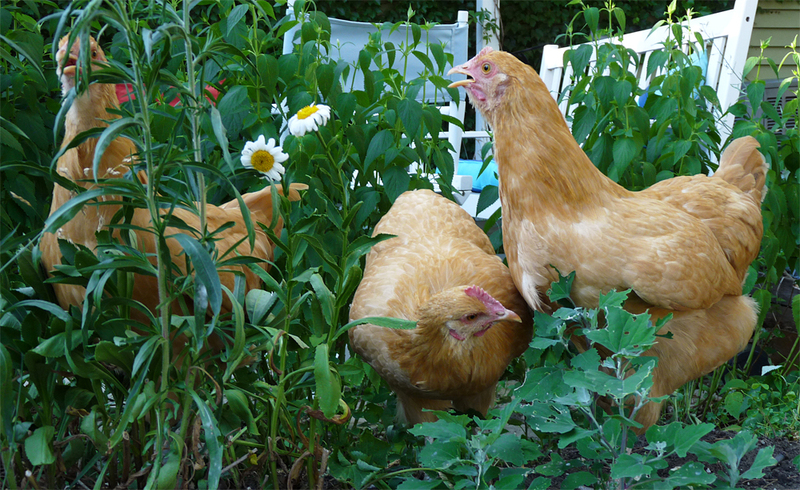 Chickens don’t appear to really love eating the plant parts, but love the fruits. It might made sense to place chicken wire around the plant prior to fruit ripening. My chickens eat the wysteria flowers when they bloom and I have never had a problem. They actually love it and as soon the petals hit the ground they eat it. Our chickens love burdock and I know of others that eat red honeysuckle berries. My chickens love tobacco, the butts of hand rolled cigarettes. This is an outrageous list, absolute hogwash. I wish you would remove it from your Internet as it has already been spread around the internet enough as it is. All websites linked throw a 404 Error, you have zero references named here. You obviously are not an expert on the subject and neither are your sources. Why confuse people to this degree. Markus: I’m not going to remove it from my Internet, nor do any of the links throw a 404 error. If you have a better list, pony up. Agree with Markus, list is about 90% manure. Trust your birds, they are honestly smarter than most all of you city slicking yuppies. Seriously I’ve never seen anything like this in all my life and neither have 4 generations of my family who have always lived through out the mountains and country from West Virginia, Kentucky, and Indiana. If I were to take your list seriously and rid my land of all those things it would be a barren dessert. Well it might look like a manicured sterile grass (only) suburb city yard where people spray their yards to kill weeds and bugs that are mostly beneficial like clovers and honeybees! And is why kids these days don’t even know what crickets or grasshoppers are or the role they play in raising chickens. Mother Nature used to have a way of weeding out idiots. That goes for chickens. They aren’t as stupid as you think and can learn for themselves what’s good for them. I would give you some advise that you should keep your birds locked in a pin because if I was your chickens I would have done ran to the neighbors! as they did not have much else to eat at the time. I agree that pokeweed is bad if it has gotten red stems like our parents told us to not eat if that late only while it was young and still green stemmed. hens and they devour it. Just caught one of my free range chooks eating petals from ornamental tobacco blossom! Usually they won’t eat anything toxic. My flock is about 5 to 8 years old and free range about 10 acres of bush land that has plenty of toxic plants. Never lost one yet. Whenever I read over this list, I find yet another plant I know my chickens eat with no ill effect. It doesn’t promote confidence. Many of the plants listed here are toxic to all animals, including humans. Including these just makes the list unnecessarily extensive.